from Bentonflocke, great composition in this layout. I love the frame on the photo and of course I am a fan of white space which Bentonflocke does so well. 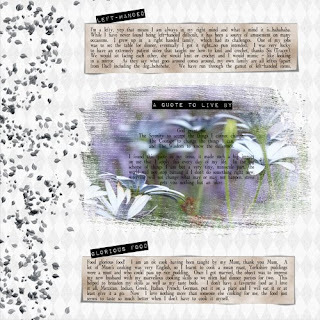 See more of Bentonflocke's fabulous layouts HERE! Wacko...did you all enjoy Australia Day yesterday, I know we did :) A good ole aussie hamburger cooked on the barbie with a coldie, life doesn't get much better! DOWNLOAD HERE! and enjoy the FREEBIE. 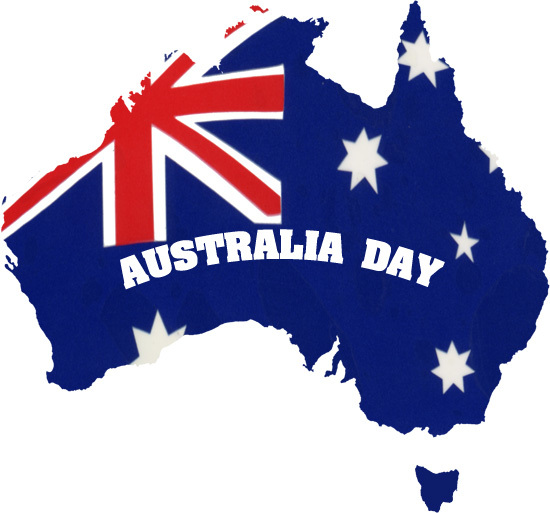 Whether your a dinkie di Aussie, a ring-in (like me) or one of them new blokes have a fantastic Australia Day. 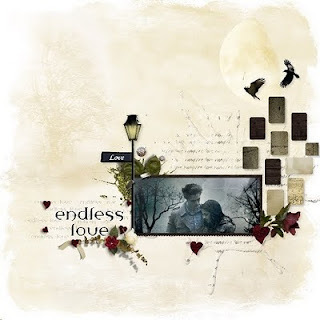 Love the ribbon circles used as frames and the blended photo as a background, great layout Diane! Visit Diane's Gallery HERE to see more of her great layouts. Brrr! There's a chill in the air. Here's the perfect kit for all those wintry photos just waiting to be scrapped. Wintry Mix is perfect for..
Gorgeous soft colours, love those delicate and pretty little flowers. Terrific white space and love the photo treatment. To see more of Angeleye's layouts visit her gallery HERE! But first you have to look at my Most Important 10 page (see the post below for journaling). Not an easy one to do, I find it hard to describe myself. I know I could have asked family to describe me but they have a different perspective. Anyway the kit I used was my Just Because, font - CK Academia, I love the loud colours they suit the treated photo well. LINK REMOVED This is a word template, so you can either use it on a layout or use it for a word album. 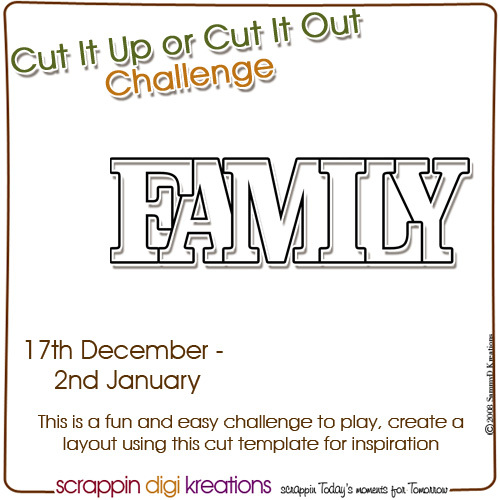 To see how we used the template for the challenge visit the gallery here. This weeks Most Important 10 project is... Describe Yourself in 5 Words...easy huh! Well not quite as easy as I was anticipating. Five word to describe me... nope it's just not coming to me. Now why would this be? I should know who I am at the age of (nearly) 45 shouldn't I? LOST - lost because for the last 22 odd years I have been THE MOTHER. That was my role... to provide, care and think for the family. The go to person for all issues and problems, ready with a bit of advice or hug where required. A shoulder to cry on when things got tough, motivator to make the tough get going. Now... now that Chris and Liz are adults, I'm still the Mum just not so much. I am not sure who I am at the moment or where I fit but I am not too stressed, life has a way of working itself out I'm just taking the scenic route. GEEK - who knew I would turn into such a nerd? I never thought I was particularly smart academics was not my thing, but I do love a challenge and computers certainly have given me that over the years. Once I got over my fear of computers and worked out that they will never think like me, we get along quite well. I love nothing more than to work with a program to find out what it can do. Five years ago I discovered scrapbooking and the web, always wanting to do things my way it wasn't long before I had my own site. Everything to do with the site I do myself, from installing and upgrading programs to changing the look and feel of the place. If I think of something I want to do with the site, I am sure to find an answer on the web somewhere. The knowledge I have gained is huge and I have probably forgotten just as much. Learn it, use it, forget it and move on to the next piece of knowledge. POSITIVE - all my life! I wake up happy (mostly), there is no better way to face the day than with a smile. I do believe every cloud has a silver lining if you look for it. I know that no matter how bad my life is there is someone, somewhere in the world who has it a darn site worse than me. When I start to moan and groan about how unfair life can be, I give myself a mental shake and take stock of all the good things in my life. I have my health, I have my family, I am loved, I have a roof over my head, I have a good job, I have food on the table, I have laughter everyday, I couldn't ask more from life. REACTIVE - but not of the nuclear kind...hehe. I have a tendency to react to situations instead of taking a well thought out approach. I was going to say I'm scatter brained but that's not true, I can be very focused when I want to be. DREAMER - do we ever stop dreaming, I often think this is what motivates us in life. I dream of having enough money so I never have to work for someone else. I dream of one day owning my own brick and mortar craft store. I dream of one day owning a top of the line Janome Sewing machine. I dream of traveling the world. I dream of never having to shop, cook or clean...oh and add washing to that list too! Even if none of these dreams come true, they are still nice to have. I love the 60/30/10 principal applied with the paper and the off centered cut out circles are a terrific touch. Want to see more great layouts...visit our Gallery HERE! Making a double post...hehehe...the Supa Digi Kit freebies are all up, so hop on over to the store to collect the lot and while your there check out the NEW RELEASES!!! 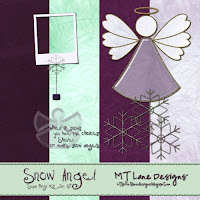 Capture your Snow Angels this year, whether they are playing in the snow or warming by the fire they will look great showcased with these delightful kits. The last two kits are available now, make sure you get them all! your fingertips! Fully layered template 12x12in .psd format and .png format. Easy to use inspiration at your fingertips! This one would be great to show off your Christmas Stars...hehehe. Download the the FREEBIE HERE and enjoy! Are you ready to go on my journey to scrap the 10 Most Important Pages...say what? The 10 Most Important Pages - what am I on about :). While reading a back issue of CK I came across an article by Brittany Beattie. Brittany has a rich family history but... one important story was missing, that of her great-great grandmother. Brittany encourages us take time to document our lives and who we are by creating the 10 Most Important Pages, so our future generations don’t have to wonder who we were. Now this is going to be a bit of a challenge for me as I don’t journal! Looking though my layouts the other day a lot of pages looked unfinished because I don’t journal, now is the time to fix that. Follow along with me as I journal these pages here. I am hoping this will inspire some of you too, to scrap those important pages. I would love to see your layouts and post them on the blog. *random fact 1 – I’m a sunny girl, having grown up in beautiful, tropical Queensland. The weather can never be too hot for me and I love humidity, dry heat makes my skin flaky...lol. I liken my love of Sunshine to that song – Sunshine, lyrics go something like... Sunshine on my shoulder makes me happy. While I love the sun and heat I try and stay out of the sun, having fair English skin I have a tendency to burn not tan :(. Bliss for me would be a holiday on a tropical island - blue water, white sandy beaches with nothing to do but read a book and relax. *random fact 2 – As a child I loved the world of fairies and magic found in books. Mr Pinkwhistle by Enid Blyton was a favourite but, alas one I don’t have any more. The three Investigators series by Alfred Hitchcock when I was a teen, stirred my love of books further and I haven’t stopped reading since. I still have a tendency to read fantasy but also love horror, sci-fi and everything in between. Dad and I have a few favourite authors that we like to collect, luckily we share the same tastes in books as our ever expanding library can attest to. *random fact 3 – I’m a lefty, yep that means I am always in my right mind and what a mind it is...hahahaha. While I have never found being left-handed difficult, it has been a source of amusement on many occasions. I grew up in a right handed family which had its challenges. One of my jobs was to set the table for dinner, eventually I got it right...no pun intended. I was very lucky to have an extremely patient sister that taught me how to knit and crochet, thanks Sis (Tracey). We would sit facing each other, she would knit or crochet and I would mimic - like looking in a mirror. As they say what goes around comes around, my own family are all lefties (apart from Dad) including the dog...hehehehe. We have run through the gamut of left-handed items, the usual coffee mugs, scissors, calculators etc. Most of these items were just for a joke but in all honesty, being a dressmaker I really couldn’t live without my left-handed scissors. *random fact 4 – A quote to live your life by! God grant me The Serenity to accept the things I cannot change, The Courage to change the things I can, and The Wisdom to know the difference. I found this quote in my teens, it made such a big impact on me that I apply this every day of my life. In the big scheme of things I am but a very tiny miniscule part. The world will not stop turning if I don’t do something right now, worrying will not change what may or may not happen, stress gets you nothing but an ulcer. *random fact 5 – Food glorious food! I am an ok cook having been taught by my Mum, thank you Mum. A lot of Mum’s cooking was very English, so I Iearnt to cook a mean roast, Yorkshire puddings were a must and who could pass up rice pudding. Once I got married, the object was to impress my new husband with my marvellous cooking skills so we often had dinner parties for two. This helped to broaden my skills as well as my taste buds. I don’t have a favourite food as I love it all, Mexican, Indian, Greek, Italian, French, German, put it on a plate and I will eat it or at least give it a go. Now a days I love nothing more than someone else cooking for me, the food just seems to taste so much better when I don’t have to cook it myself. YAY...WOOT! WOOT!...YIPPEE...I did it, I really did it :). Well that wasn’t as hard as I thought it would be and it was just a little bit fun, now to put it all in a layout. I will be back with another Most Important 10 next week, see you all then. 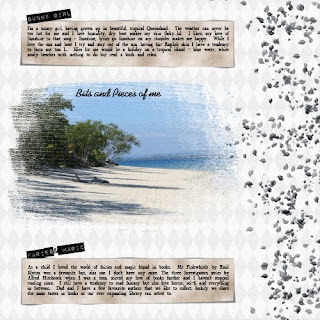 You can see more of Dana's gorgeous layouts in her gallery HERE! OMGosh, Pixelfairy has the most gorgeous kit out 'It Hurts So Good'... inspired by Twilight, True Blood and Vampire Diaries. 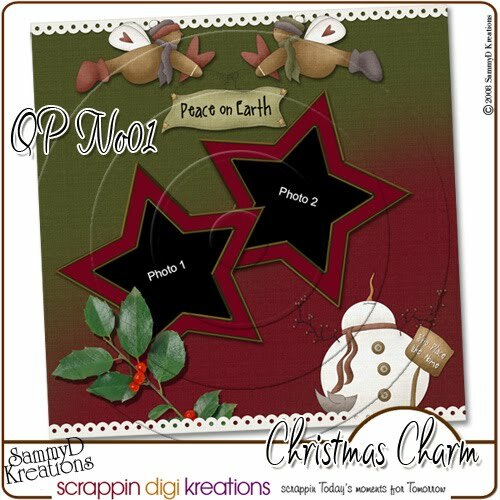 Take a look at the brilliant layout by Kleenesandra and I have finally found time to design...WOOT! WOOT! Ain't Miss Behavin' is my latest offering, classic black and white with a dash of red and torquoise. I really enjoyed make this kit, so much in fact I made some photocards too! 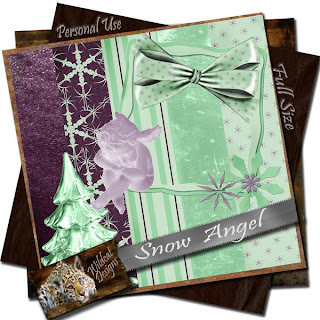 Capture your Snow Angels this year, whether they are playing in the snow or warming by the fire they will look great showcased with these delightful kits.Six kits to collect, make sure you get them all!